But really, all I want for Christmas is a Bain Marie, because it holds my clarified butter and one must have clarified butter while cooking. So I explained to my kiddos: clarified butter is butter that you gently melt butter (not by boiling) to separate the 3 parts of butter (water, butter fat and milk solids). The water evaporates, the milk solids settle on the bottom and all you are left with is butter fat (approximately 80% of the butter you started with---in case you are curious). Skim impurities off the top, leave the solids in the bottom and save all the butter fat. Clarified butter is a lot less susceptible to spoilage and has a higher smoking point; it is considered more stable than whole butter. You can store the butter fat/clarified butter in the fridge, covered (for up to a month), but when cooking you want it by your side, melted. Which is why I want a Bain Marie: a hotel pan, if you will, that goes on my stove, half filled with simmering water to hold items warm. Like butter. Or soups that are already made, or a sauce you made in advance but need to keep warm until you serve it. Why clarify butter? Because it has a much higher burning point. So you can saute foods at higher temperatures, without the butter burning. In many cases, whole butter is great, but sometimes when you are sauteing or pan frying or something of that nature, you want a more stable butter. 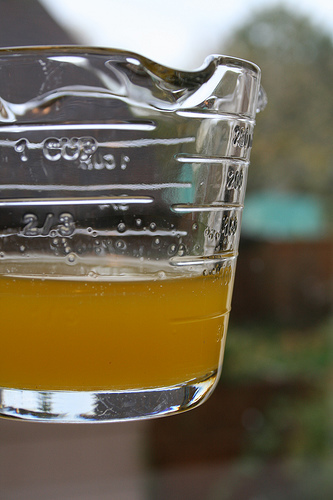 Going forward, if I use clarified butter, I will note it as such, and link back to this page. A little secret: I don't really need a Bain Marie for my clarified butter and neither do you. I put my pyrex (heat proof) measuring cup into a small saucepan with barely simmering water. The butter melts beautifully and holds there just as easily... But please don't tell Santa.